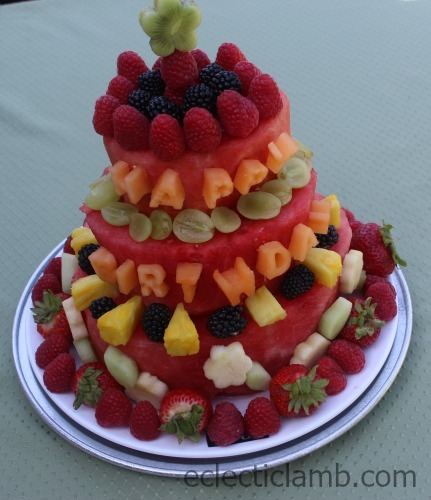 Two of my nephews, my niece and I made this fresh fruit cake to serve with dinner on their Mom’s birthday. My sister-in-law is a fan of fruit so it seemed like the perfect time to make this cake (it was on our summer 50 to-do list). 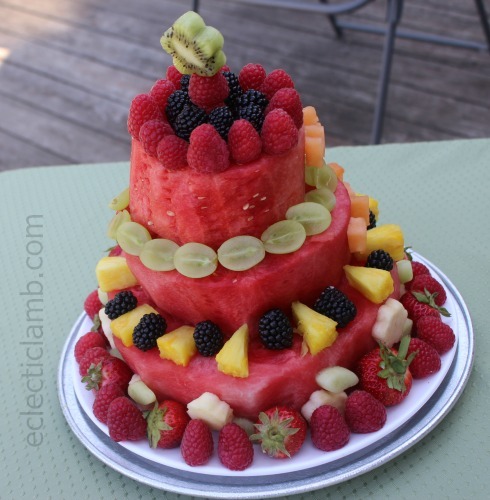 I used a semi-large seedless watermelon and a small round seedless watermelon to make the tiers. I cut them at home by myself. It was difficult to get exact rounds even though I used a bowl as a guide. It took me at least 35 minutes to get the tiers cut. I was disappointed that the tiers were wonky but once we added fruit it looked fine! I packed up my cutting board, knife, cookie cutters, toothpicks, and skewers, spaghetti (to attach the letters, flowers and leaves), and all the fruit and transported it to my sister-in-laws house where we assembled the cake on their back deck. I was inspired by this, this, and this. I knew it might be a little chaotic making this with several people so I made a drawing as a guide. While we made the cake the kids enjoyed eating the fruit scraps and discovered that their Border Collie does not like apples. But my nephew told her it was “human” (food) and then she ate a slice! Yes this cake is not as perfect as it would be if a food stylist worked on it for hours by themselves. But I think that this is more special. It was a memorable project to complete with my niece and nephews and a special gift for their Mom. The family of 7 enjoyed eating the fruit and my sister-in-law was very thankful. 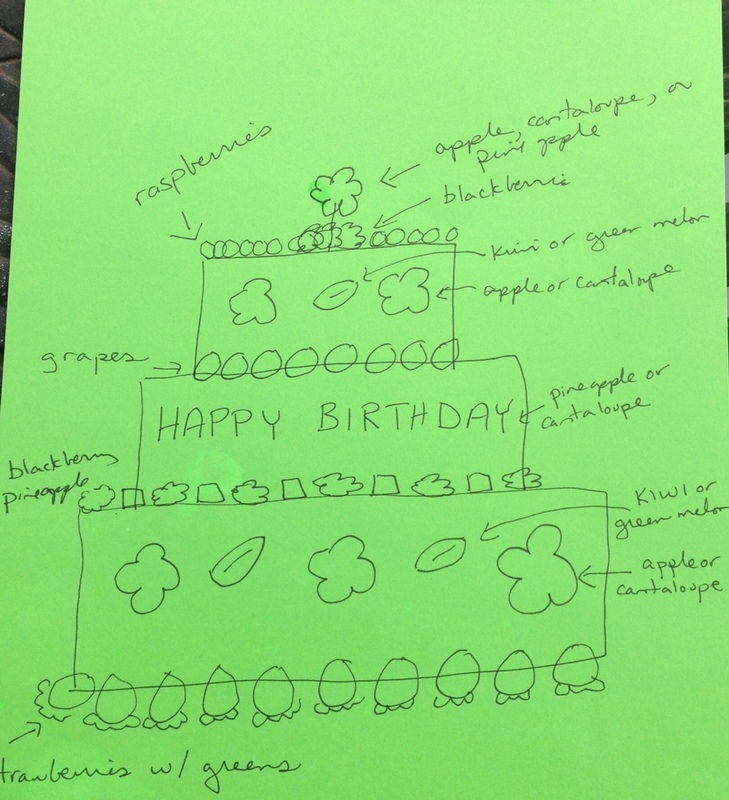 Think about color when planning your cake. Make a sketch before you go grocery shopping so you buy the fruit you need. Buy a mixed variety of fruit (this is not a cheap project). 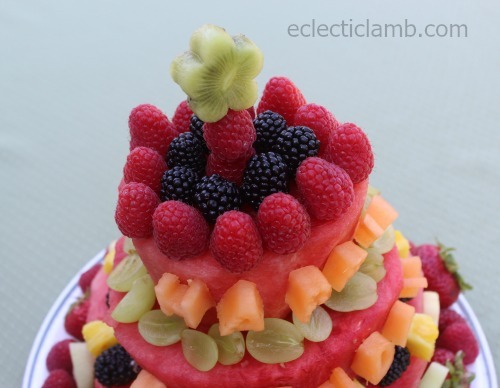 Don’t worry if your tiers don’t look perfect – cover them with fruit. Allow a lot of time to complete this project! This took at least 1.5 hours to cut and assemble. If you will cut letters or shapes make them first (to make sure you have the fruit you need and to get the most difficult part done first). Have a lot of people available to help eat your cake. This entry was posted in Bento / Cute Food, Party Planning. Bookmark the permalink. I love it!!! What a great and healthy project! That’s a cake I would enjoy! This is fantastic! Pinned & yummed! !